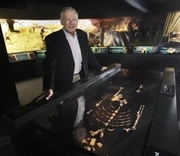 Dr. Donald Johanson, founding director of the Institute of Human Origins at Arizona State University, poses with his discovery, the 3.2 million-year-old Lucy skeleton, part of the "Lucy's Legacy: The Hidden Treasures of Ethiopia" exhibit at the Discovery Times Square Exposition in New York, Wednesday June 24, 2009. Donald Johanson became famous as the co-leader of the team that in 1974 discovered in Ethiopia the first specimens of Australopithecus afarensis, including the 1974 find of "Lucy," a 40 percent-complete fossil from 3,300,000 years ago. The year before Johanson had found the first known knee joint of any prehuman hominid, which provided the first hard evidence of upright stance. In 1975 his team found a large collection of A. afarensis fossils and the following year the oldest known stone tools, dating from 2,500,000 years bp. He founded the Institute of Human Origins in 1981. Donald C. Johanson is currently considered a "single author." If one or more works are by a distinct, homonymous authors, go ahead and split the author. Donald C. Johanson is composed of 6 names. You can examine and separate out names.